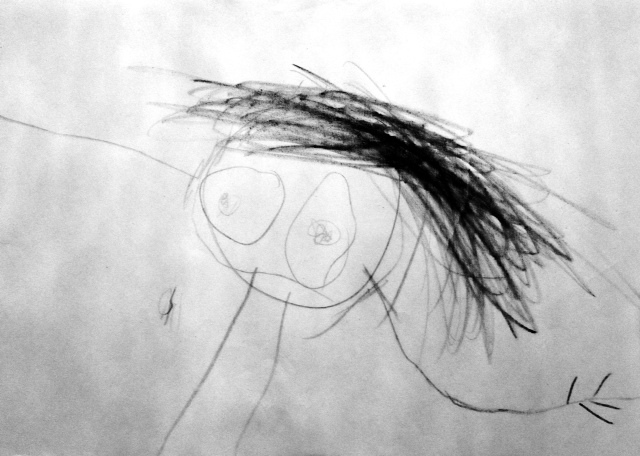 I recently heard a radio program on the topic of dealing with your children’s artwork. Many parents share in this dilemma. With so much art being produced by kids these days, it can be overwhelming. What should you keep? What gets thrown away? I’ve kept absolutely everything over the years, believing that someday I would, somehow, deal with it. Since our move, we’ve had a lot of clearing out and organizing to do and, with less space than we’re used to, that “someday” has arrived. The multiple bins that contained literally hundreds (possibly thousands!) of pieces of art from the girls had to be dealt with. It was simple enough: two piles, one to keep and the other throw away. Who knew that something so simple could be so painful? Opening the bins brought back a flood of memories. Each piece of construction paper I held in my hands took me away. How could I choose to throw these treasures out? The early fat crayon scribbles, slowly evolving into circles, which over time became amoeba-like faces with long legs and arms. I remember vividly sitting at the kitchen tables of our past, my babies on my lap or in their high chairs, watching them struggle to hold their crayons in their chubby little fingers. Little tongues poking out. A look of intense concentration on their faces…Me stooping repeatedly to pick up the crayons that would roll to the floor. These scribbles are not just lines on paper. They are a direct link to my old self; a time that already seems like a lifetime ago. A young mother getting through her days, cold cups of coffee on the counter…. Envelopes roughly put together with masking tape, letters to Santa, school art, cards, glitter and glue…all of them – every single one – a masterpiece. Memories keep flooding through me. Holding hands to cross the street, cool morning walks to school. Hot, sweaty summer days at the park, sand in their shoes. Picnics, tantrums, little wet bodies in warm baths. Dirty faces turned upwards for me to wipe. Days so full of happiness that I could burst, and days so difficult with self judgment and resentment that I wanted to curl up and die. In the end, I did manage to throw away a lot of art. But, the pages were photographed and stored as bits of digital data. As for the throw-away pile, my husband unceremoniously took them to the back of the barn and burned them in an old oil drum. I imagine, though we never talked about it, that he had his own memories to deal with as he placed them one by one into the flames. It must not have been easy. Our little artists are big girls now. I no longer need to hold their hands or wipe their faces. Those days are gone. But what does remain is their love of drawing. And even though they don’t write “I love you” across the top of every page anymore, the act of showing me their work, and awaiting my praise is just another way of showing it. I still have a baby in my life. 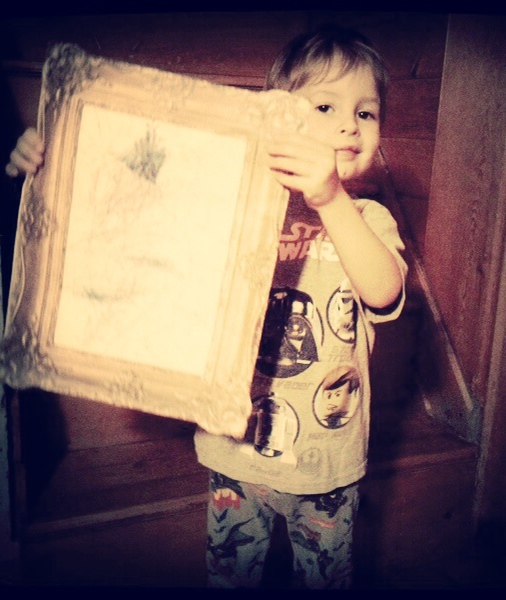 My son is three and rapidly accumulating an art collection of his own. I am acutely aware of how precious my time is with him, having seen how quickly time flies and kids grow up. I take the time to sit and appreciate the many moments we have together. His drawings are in the “long legs and arms jutting out of the big head” stage right now. Soon, his name will find its way onto the pages. And then, the Mommy and child, the “Daddy I love you” and the flowers and rainbows. And with every masterpiece he creates, another memory is safeguarded for years to come.